Heather Mills has been in the public eye for over two decades and at the forefront of the animal rights movement for most of that time too. With a wealth of experience under her belt in all things plant based, we’re delighted that Heather will be writing a monthly column for PlantBased and sharing her extensive knowledge with you all. 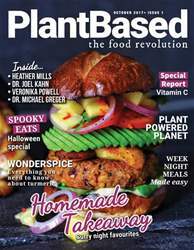 For this first issue, however, we sat down to speak with Heather to discuss her hugely influential role in the vegan movement, the challenges ahead and the benefits of eating plant based.